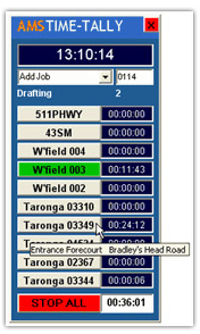 Time-Tally is a simple yet secure method for employees to track the time spent on various jobs from their PC terminal. >Accurate record of billable time for eacj job, perfect for designers, lawyers, architectural firms, engineers, creative studios etc. >This software application can be used exclusively, or in conjunction with swipecard or biometric time clocks. >Seamless link with TMV5 software and then to payroll.